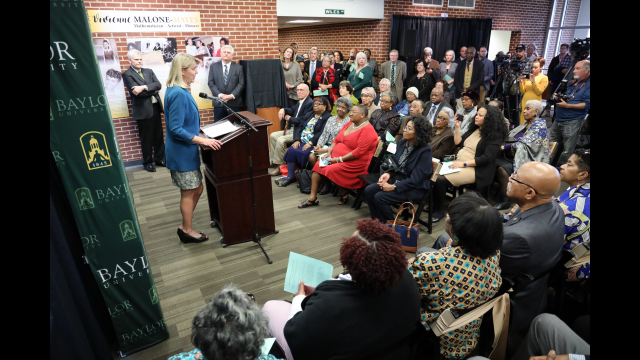 WACO, Texas (Feb. 28, 2019) – Before an overflow crowd that included the daughter of the late Vivienne Malone-Mayes, Ph.D., Baylor University recognized the exceptional life and achievements of the University’s first African-American faculty member during a special ceremony Feb. 26 on the third floor of the Sid Richardson Building. 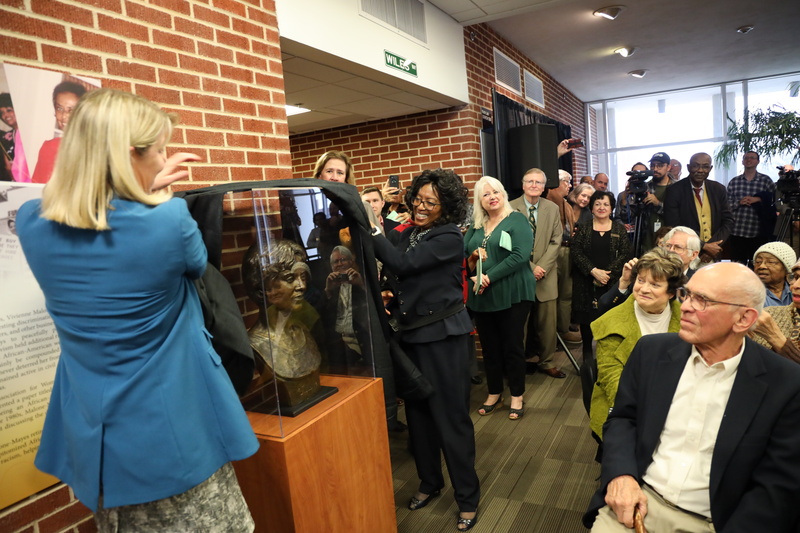 Held during Black History Month, the event included the unveiling of a 50-pound, two-foot bronze bust of Dr. Malone-Mayes, who taught math at Baylor from 1966 to 1994. 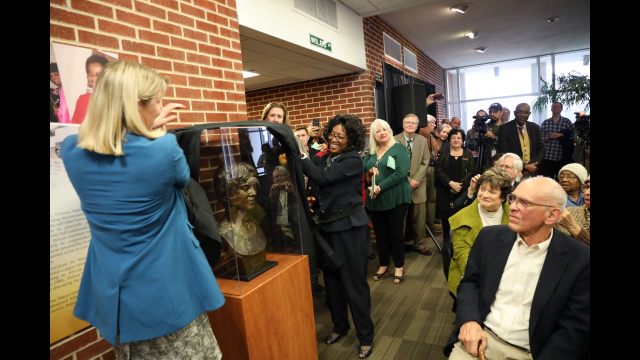 The bust was created by Utah sculptor Dee Jay Bawden. Encased in glass and on display at the entrance of the department of mathematics, it represents the first sculpture of a female professor or alumna on the Baylor campus. 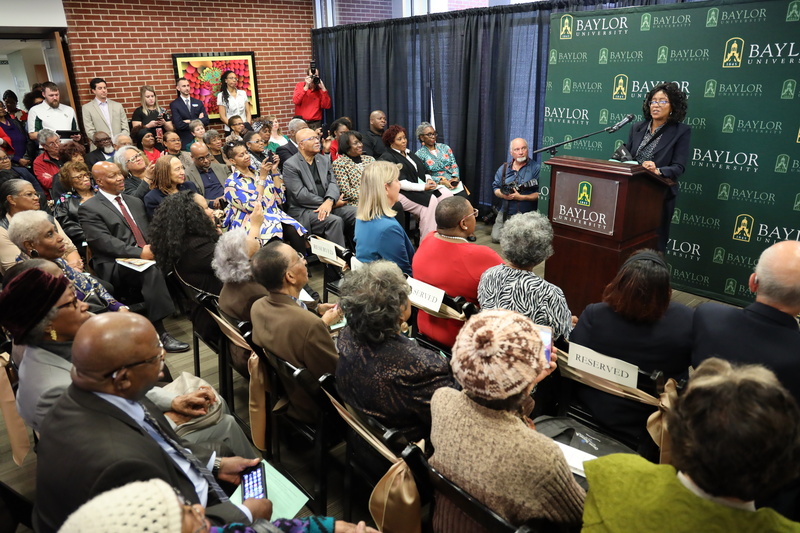 In addition, three panel displays highlight Dr. Malone-Mayes’ experiences and history at Baylor, which included being rejected when she applied to Baylor in 1961 because of her race. “Vivienne Lucille Malone was born Feb. 10, 1932, the only child of Pizarro and Vera Estelle Allen Malone; her family included educators and community leaders. She grew up in Waco and graduated at age 16 from A.J. Moore High School, not far from the Baylor campus. “She earned bachelor’s and master’s degrees in mathematics from Nashville’s Fisk University, where she was taught by Dr. Lee Lorch, a prominent desegregationist, and Dr. Evelyn Boyd Granville, the second African-American woman to earn a PhD in mathematics and the creator of computer software to analyze satellite orbits for NASA programs. She married dentist James Mayes during this time and later became the fifth African-American female to earn a mathematics PhD. She credited Granville as the primary reason she pursued the degree. “Malone-Mayes chaired the math departments at Bishop College in Dallas and then Paul Quinn College, which was in Waco at the time. 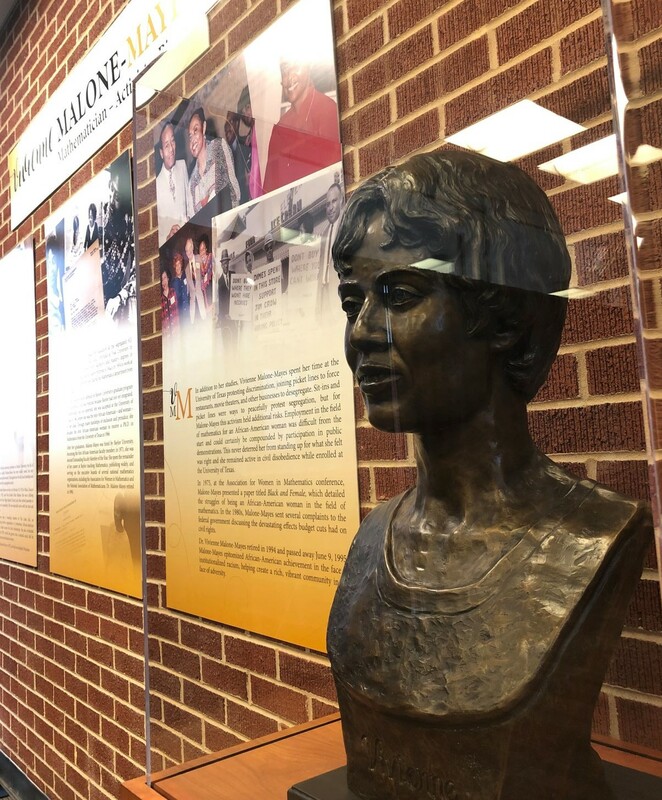 Because she wanted to take more graduate-level classes courses, Malone-Mayes applied to Baylor in 1961, but she was rejected because of her race. (Baylor trustees voted to integrate Nov. 1, 1963.) Malone-Mayes framed her Baylor rejection letter as a reminder of the struggle for academic equality. 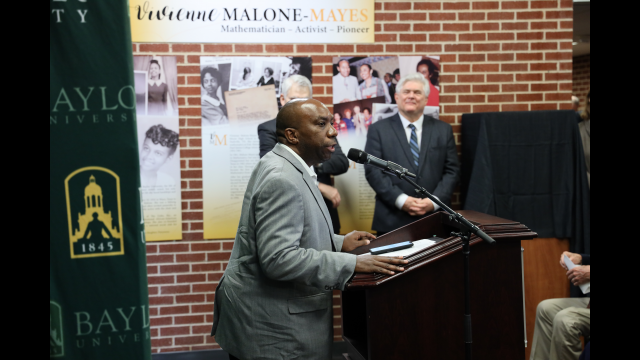 In 1966, Dr. Malone-Mayes joined the Baylor faculty as a professor of mathematics. In 1971, Baylor Student Congress named her as an Outstanding Faculty Member of the Year. Ill health forced her to retire in 1994 after 28 years at Baylor. She passed away June 9, 1995, at age 63. 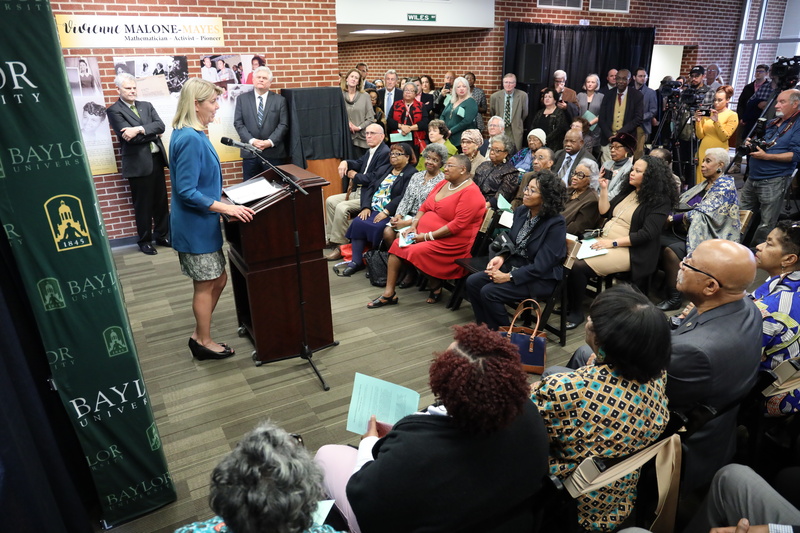 Baylor President Linda A. Livingstone, Ph.D., was one of several speakers at the ceremony who reflected on Dr. Malone-Mayes’ life and the values she represented. 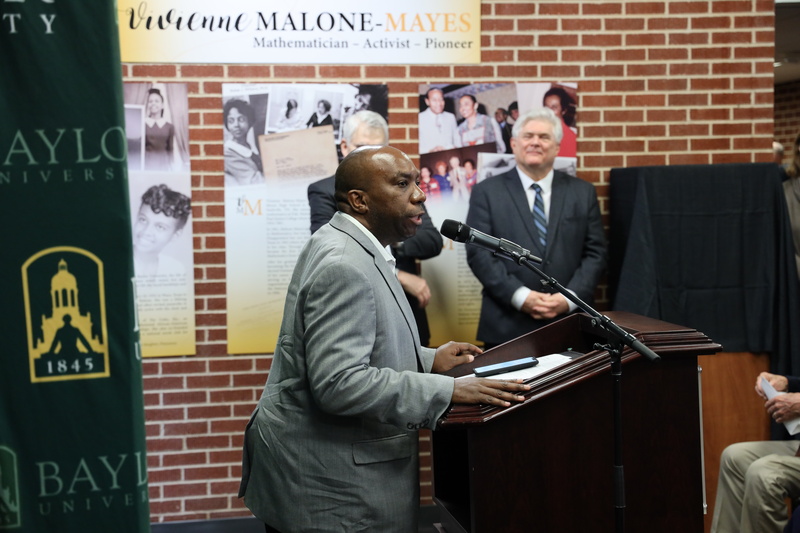 Dr. Malone-Mayes’ professional associations included serving as a member of the American Mathematical Society, the National Council of Teachers of Mathematics and the Mathematical Association of America, where she was elected director-at-large for the Texas section. She also was the first black woman elected to the Association for Women in Mathematics’ executive committee, and she served on the board of the National Association of Mathematicians (NAM), which seeks to promote the success of underrepresented minorities in the mathematical sciences. 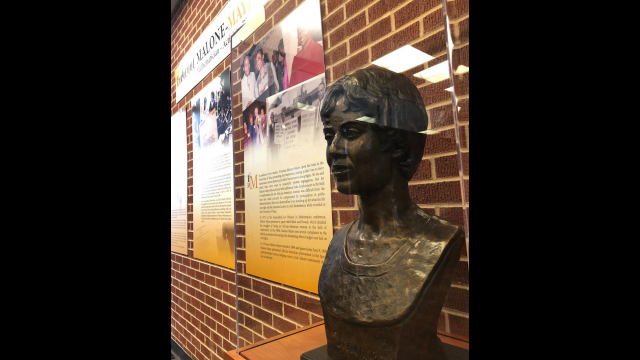 Along with her academic pursuits and lengthy teaching career, Malone-Mayes was a strong servant leader in the community. She was a lifelong member of New Hope Baptist Church, where she was organist and director of the youth choir. Malone-Mayes advocated for Waco ISD students and served on several boards and committees, including Family Counseling and Children Services, Goodwill Industries, and the Heart of Texas Region Mental Health and Mental Retardation Center. Also giving remarks were Howard Rolf, Ph.D., Professor Emeritus of Mathematics and department chair when Dr. Malone-Mayes was a member of the Baylor math faculty; and Robert Darden, professor of journalism, public relations and new media and director of Baylor’s Black Gospel Music Restoration Project. 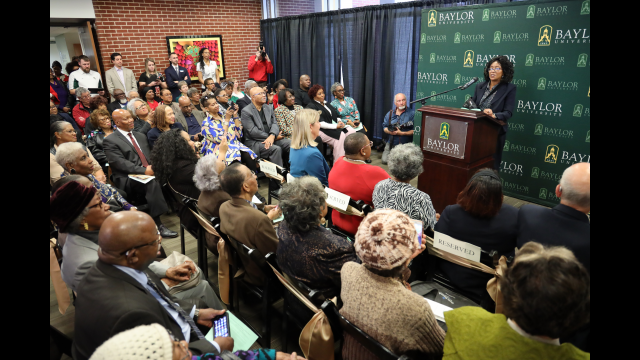 Darden was instrumental in leading the University to recognize Dr. Malone-Mayes and also challenged Baylor to further honor her by diversifying its faculty. Currently, about 15.6 percent of faculty are from minority and other underrepresented groups, but only 2.8 percent are African-American. Darden said this event could be seen “as a guide, as a goad, as a spur to us” to increase diversity. “Baylor University ought to be a light on a hill instead of always having to apologize that we are not better than we are,” Darden said.